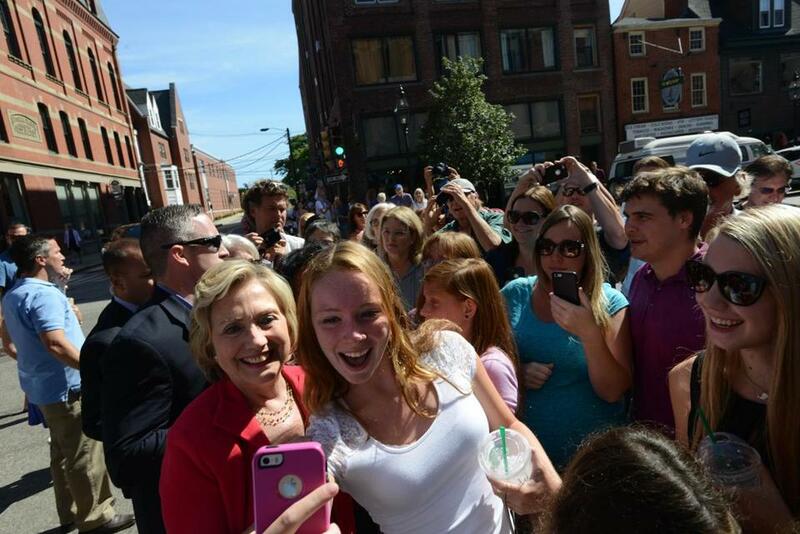 Democratic Presidential candidate Hillary Clinton took a photo with a supporter. WASHINGTON — When Hillary Rodham Clinton touches down in Ohio on Thursday she’ll be making her pitch in a critical swing state for the general election, and one that has long been inhospitable to top-of-the-ticket female candidates. Ohio voters have never elected a female governor. They’ve never put a woman in the Senate. Columbus, the state’s largest city, where Clinton will speak at a “Women for Hillary” grass-roots organizing meeting, hasn’t even elected a female mayor. Should Clinton be the Democratic nominee, her path to the White House goes directly through a cluster of bellwether states that have zero history electing a woman to the Senate or putting one in the governor’s mansion. In addition to Ohio, women haven’t been picked for the top slots in Colorado, Nevada, Pennsylvania, or Virginia. So even while the historic nature of Clinton’s candidacy is helping to buoy her chances in the primary contest by exciting the Democratic base, if Clinton wants to win the general election she’ll have to overcome obstacles that male candidates do not face. Winning-while-female means being both likable and strong, in touch with the common people and highly qualified. It also means living up to higher standards of ethical behavior than male candidates — the subject of Clinton’s most recent troubles. It’s not a simple task for someone who recently has had to redouble efforts to work on just being genuine. Republicans, well aware of the playbook, are already attacking her in areas where female candidates are particularly vulnerable. “Clinton being painted rightly or wrongly as ‘unlikable’ will damage her electability,” said Adrienne Kimmell, executive director of the the Cambridge-based Barbara Lee Family Foundation. Kimmell said female candidates who aren’t likable also are viewed as less qualified for the post, even if the candidate has excellent credentials. In the 2010 gubernatorial elections, the foundation’s research found that when women were on the ballot, the more likable candidate won in nine of 10 elections. But when the contests pit two men against each other — favorability didn’t predict the outcome. On the ground in Ohio, female elected officials say the friendliness rule remains strong. “You have to be tough, you also have to have that likability,” said Nan Whaley, the mayor of Dayton, which is Ohio’s sixth-most-populous city. Whaley dispenses hugs to voters who say they will support her. Since Clinton left the State Department and sought the White House, her likability ratings have capsized. They went from 59 percent of respondents saying they had a favorable impression of her in February 2014 to 41 percent reporting a favorable impression when surveyed this month, according to the Gallup poll. Clinton’s campaign is striving to humanize her with an authenticity offensive in coming weeks intended to find opportunities to showcase her personality. Already there has been some evidence of it: On Wednesday she joked about President Vladimir Putin of Russia during a question and answer segment at the Brookings Institution in Washington. “I don’t admire very much about Mr. Putin, but the idea you can stand up and say, ‘I will be your next president’? That has a certain, you know, attraction to it,” Clinton said. She also taped a segment for “The Ellen DeGeneres Show” that will air Thursday. And next week Clinton is set to banter with late night TV host Jimmy Fallon — an interview that will be broadcast the same night as the second GOP presidential debate. The Clinton team is also moving aggressively to address another area that’s uniquely potent to female candidates: ethics. Typically women candidates are seen as more ethical than male counterparts — but when knocked off that pedestal, they suffer disproportionately, according to the Barbara Lee Family Foundation’s research. “Voters expect women to be better,” said Kimmell. The dynamic helps explain why persistent questions about Clinton’s unorthodox use of a private e-mail server while she was secretary of state are particularly dangerous for her candidacy. She followed up with a burst of electronic mea culpas hours later, posting a 207-word apology on her Facebook page and sending out an e-mail with the same message. Clinton does score well in areas that cause many female candidates to stumble. She’s a prodigious fund-raiser, and importantly, she’s viewed as highly qualified for the job. And Clinton’s strategists believe the historic nature of her candidacy will help energize the base in November, particularly motivating young women to vote — a group that tends not to turn out in large numbers.